Chances are, the historic stained glass in your cathedral has been around for some time. It may even be as old as your church, and could have even possibly been painted by a famous artist. Many churches feel that preserving stained glass is important for keeping the history of their church alive and therefore choose to opt for cathedral stained glass restoration in Houston after signs of wear, such as chips and cracks, arise. However, it may come as a surprise that while there are numerous historic churches in the US, there are only a handful of experts in the nation who are qualified to perform this procedure. If you are considering cathedral stained glass restoration or have an appointment schedule to have your stained glass inspected, you may have some questions about the repair process. 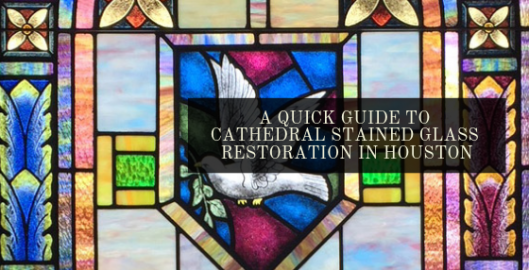 Below, we’ve provided some details on the cathedral stained glass restoration process so Houston churches, like yours, can know what to expect before diving into a project. Cathedral stained glass restoration is a process a Houston professional will undertake to repair and restore aged stained, painted, or colored glass. The process is usually performed to remedy a structural issue with a stained glass window or to correct damage that has been caused by physical contact or trauma, such as vandalism or flooding. While the procedure does require a significant sum of funds, most churches are able to offset the financial burden through fundraising or donations. No work should be performed on stained glass until it has been completely inspected from top to bottom and its monetary value or worth has been accurately assessed. This is simply to ensure that the church does not spend funds on unnecessary procedures. Sometimes, stained glass is able to be repaired onsite. Other times, the best route is to remove the stained glass and transfer it to a studio where it can be taken apart, repaired, and reassembled in a safe, controlled atmosphere by industry experts. Do you have questions about cathedral stained glass restoration? Does your Houston church need to schedule an onsite inspection? Contact our office today to speak to an expert about your needs.